In my last blog I began to look at the impact of PSD2 from the point of view of the individual, and examined why the time is propitious for such change. Now let’s look at what PSD2 does, and more particularly what is its impact going to be for the consumer – for you and me. Let me start with what it is designed to do, and to do this allow me to put on my EU regulator’s hat, (yes I know it doesn’t suit me, but some sacrifices have to be made). EU regulators have an overarching mandate: to create, from the chaos of 28 countries’ financial, legal, economic, etc. systems; unified, logical and simple codes that provide an efficient basis for business in the EU. 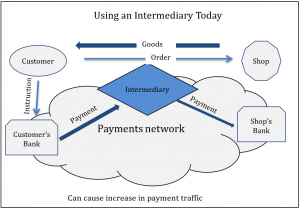 In the past, payments in different EU countries have grown at different speeds and with different characteristics – making cross border business difficult and even domestic business inefficient. For example many countries have relied too heavily on credit as a basis for payments, thereby increasing risks while others have opted for ‘delivery versus payment’ transfers (DVP) or payment insurance based structures that have increased costs for retailers and customers. 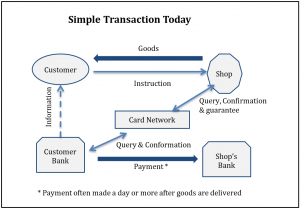 PSD2 gathers up all of these disparate systems, creates a general set of classifications – establishing who can participate in the payments game and in what capacity; then it sets out rules to allow the fair and efficient functioning of the system across all countries, thereby increasing competition. When you say it that way, it seems like a really good idea – and indeed I believe it is a really good idea – but as usual the devil is in the detail. Let us take a human scale example: You are going to buy a television set. Today you might enter a store (virtual or physical), choose a set and use your debit card to pay. Some people might think that there are only two parties to this transaction – you and the retailer, but the wiser of you will realise that your bank also has a role –confirming the funds and routing the payment to the shopkeeper (eventually). The even wiser will realise that there is yet another participant – as it is unlikely the shopkeeper will bank with your bank – there must be a transfer between the payer bank and the payee bank. The downright brilliant of you will realise that there is even one more participant in the transaction – the operator of the card/payments network(s). So this simple transaction has a number of participants, connections and associated costs. In the UK these costs currently amount to about 0.68% of the value of the TV; they are paid by the shopkeeper, which as we all know, ultimately means paid by you, the purchaser. 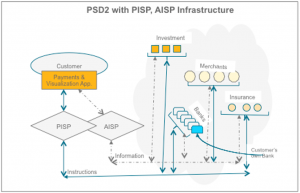 Under the PSD2 rules it would be nice to think the picture is simpler – well eventually that should be the case but in the short term things might get a little more complicated as we will see at least one other player: the PISP (see definitions above). Now you might say that such an entity is simply a payment intermediary, such as exists today in the form of PayPal for example. The difference under PSD2 is that this role will be formalised and supported by the new infrastructure, rules – especially the access to customer’s bank accounts directly by the PISP. Again using a real world example: where today you might use PayPal to buy the TV by crediting your PayPal account by direct debit and instructing PayPal to pay the retailer (two transactions). Under PSD2, PayPal, by using the open API, which the new regulations say must be available to all users, could simply pay the retailer by debiting your bank account (one transaction). You might now be forgiven in thinking that there does not seem to be much in this for you, the customer. Who really cares how many transactions are made or which way the money flows as long as you get your TV? Well in fact there are some very good reasons why you should care. Firstly there is an innocent sounding element of PSD2 that has a major effect on costs: i.e. that all participants debiting/crediting a user’s bank account must be charged at the same rate. But at present, as we all know, most banks do not charge customers to debit their own account, so under the PSD2 rule PISPs would likewise not be charged. This could result in a reduction of costs for retailers which can, indeed should, benefit the customer. This effect can be further enhanced if the merchant itself becomes a PISP. In this case, by directly debiting the customer’s bank account, the seller might save most of the 0.68% fees, and so deprive the banks and others of this income. What is this worth? Well estimates vary but it might mean a reduction in UK bank incomes of £1.5 billion over the next three years and a benefit to retailers/ consumers (depending on the split) of about the same amount. Yet this financial benefit is actually perhaps the least of the benefits of PSD2 compared with the other advantages that can accrue from PSD2. 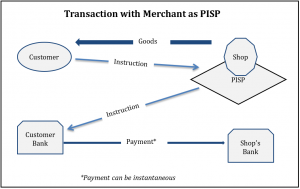 The first class of such benefits comes from the ability of the PISP to offer links to a wide range of merchants, financial services and banks. The insurance for your TV, the nifty TV stand and the Netflix subscription can all be acquired, not just from the retailer but from a wide variety of suppliers offering competitive prices. But wait a moment – even this is not the most significant benefit. The PISPs can offer you an application that not only tracks your spending and your bank account but also any other accounts, savings, income, fees, etc. you have. So perhaps to pay for your TV you want to use some funds from your building society account – your PISP can use those funds without having to move funds first to your bank and you may be able to see a consolidated picture of all the different accounts, payments etc. on your phone or laptop. These benefits bring me to the role of AISPs (see above for definition). AISPs may (with your permission) collect the transaction and payment information from banks and PISPs, building up the payment history. They can then provide this information to those who will provide you with your own financial management applications as well as to merchants and service companies offering their products to you via a PISP. Turning to our examples above, you might be offered better savings rates in a different building society to the one you are using and, because your personal account information is already held by the PISP, switching from your current provider to another could be done with a single, simple instruction. 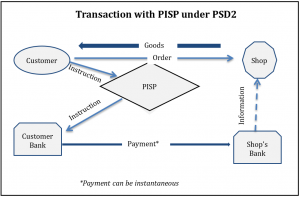 By allowing financial intermediaries (PISPs and AISPs) to access banks via open APIs and link to many service and product suppliers, the PSD2 regulations will therefore provide cheap and efficient access to many more services and a platform that allows customers to make financial decisions at their leisure – but then operationalize them in an instant. Finally, and perhaps the major benefit to customers is one we have yet to mention: that all transactions conducted in under this PSD2 rule-set will be protected – so whether you are buying the products of a travel agent or an investment manager, your payments and your receipts will be guaranteed. In the next blog I will move on from the effects on the ultimate customer to how existing users of payments systems can prepare for the changes – both in terms of systems and strategy.